Any type of Asian take out I’m a bit leery of – health wise. I know they claim to be healthy but I never know how much oil and salt I’m really eating. Actually, I do know and just tend to go into denial when it’s 9pm, I have no dinner ingredients, and the take out menu is right there. It’s a lot of oil (and most likely salt too) because when I open my take out container the next day to find stiff noodles and congealed sauces I realize it is due to the oil that has bonded in the fridge. 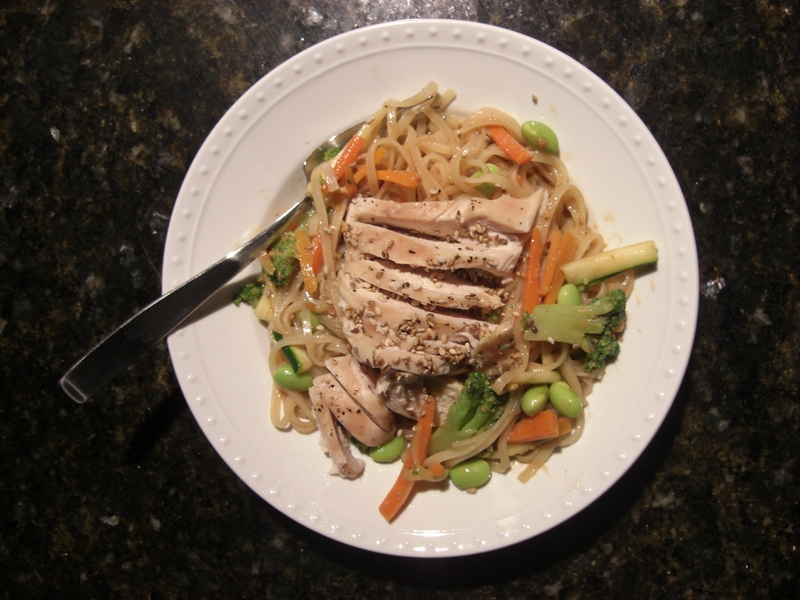 So one plus to making your own asian inspired meals is you know what you are eating. And the pluses do not stop there. I feel like it tastes better – cleaner, healthier, fresher. You are assured to have only the ingredients you like. There is not a trace of mushrooms in my noodle pot. And there is no delivery fee. I can find only one drawback; the clean up. I guess just figure it is another way to get healthier – by lifting the pots and cleaning the pans…a little arm work out, right? Preheat oven to 350 degrees. Spray glass baking dish with nonstick spray. Lay chicken in dish and season with salt and pepper on both sides. Once oven is preheated, bake chicken for 15-20 minutes or until opaque in the center. Remove from oven and let cool. Once cool, cut into slices or bite size pieces. Bring 4 quarts water to boil in a medium stockpot. 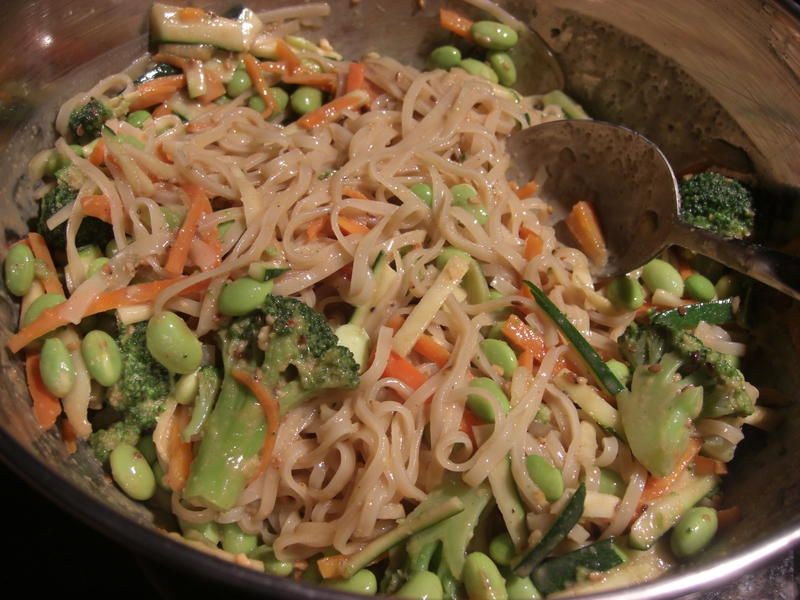 Add broccoli and edamame, cook until bright green and tender, only about 6-8 minutes. Drain. Refill same pot with 5 quarts water and bring to a boil. Meanwhile, toast the sesame seeds in a small skillet over medium heat, stirring often, until golden and fragrant, about 10 minutes. Watch out – these things pop up and out of the skillet when they get too hot. Reserve 1 tablespoon of the sesame seeds in a small bowl. 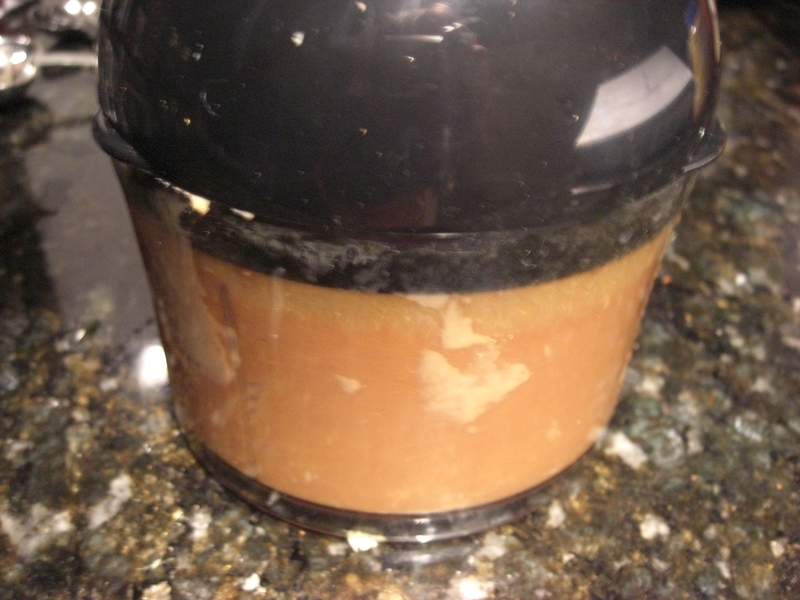 Put the remaining 3 tablespoons in the blender or food processor. 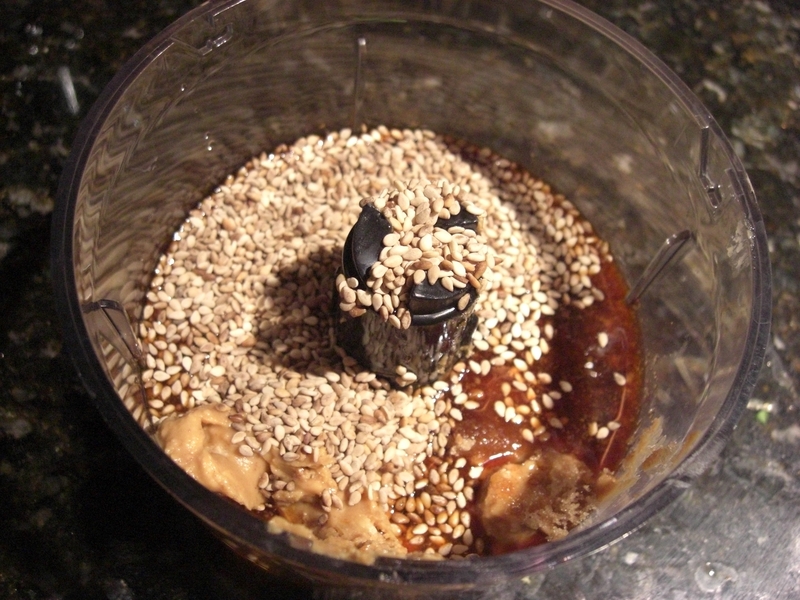 To the sesame seeds in the blender, add the peanut butter, garlic, ginger, soy sauce, vinegar, hot sauce, and sugar. Puree until smooth, about 30 seconds. With the machine running (if possible…), add hot water 1 tablespoon at a time until the sauce has the consistency of heavy cream. Set aside (can be left right in blender). Cook noodles in boiling water according to box directions – most likely: add a few pinches salt and noodles to boiling water. Cook noodles until tender, about 8 minutes. Drain then rinse with cool water; drain again. 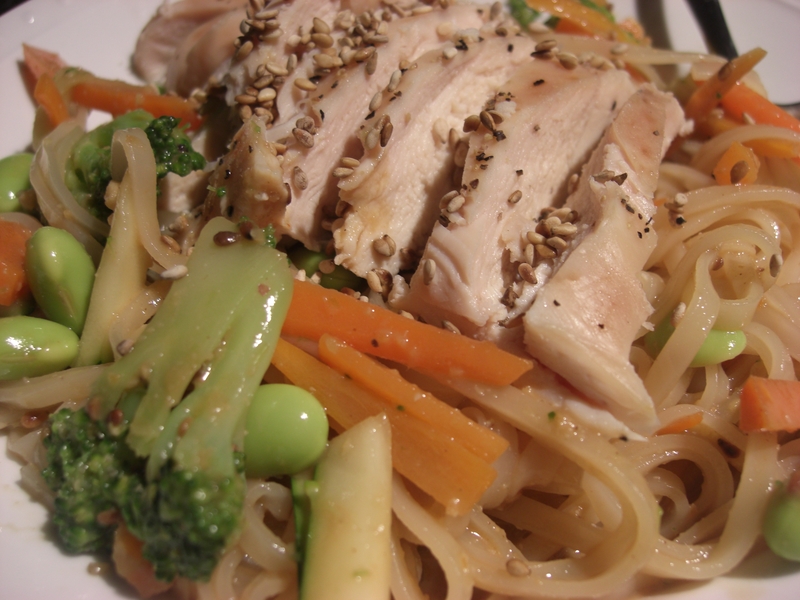 In a large bowl, toss noodles and sesame oil. Add broccoli, edamame, carrots, zucchini, chicken and sauce. Mix with tongs or slotted spoon until well combined. Place servings into individual bowls and top with reserved sesame seeds. Serve with soy sauce on the side.